On the way home thinking about our conversation I noticed a lot of pull trailers traveling I-95. When I returned home, I purchased 3 enclosed pull trailers. 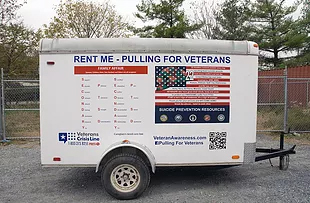 (4 X 8, 5 X 10 and 6 X 12) and created "PULLING FOR VETERANS" awareness trailers, rolling billboards, if you will and started loaning them out educating and bringing awareness to PTSD, and the 22 Suicides a Day. A legal friend of mine told me loaning the trailers our puts me at a lot of liability if something happens. So I started a LLC company. The idea was born, As founder of Dollar an Hour Trailer Rental, LLC. We rent trailers bringing awareness to PTSD, for a $1.00 an hour ( 4 X 8 Enclosed Trailer), $1.50 an hour ( 5 X 10 Enclosed Trailer), $2.00 an hour (6 X 12 Enclosed Trailer) + $10 damage liability waiver per trailer, per 24 hour period. So Awareness Trailers turned into a mission. $1 an hour - It's more about the MESSAGE than the MONEY. I and other local veterans, businesses, friends, and veteran organizations help blasts it out on social media, Facebook, etc. As social media does its thing, the way it works spreading the news of educating and bringing awareness to the populace. The populace (small contractors, veterans, friends, home owners, etc.) will rent a trailer to go pick up large purchases, or landscaping projects, or take your motorcycle to??? 100% of trailer rental income helps assist veterans. 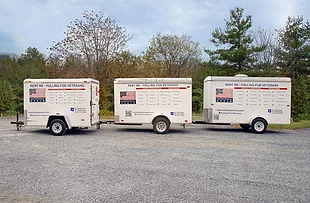 I have a small business with little bit of land to rent 3 trailers out to help educate and bring Awareness to the 22 veteran suicides a day (PTSD). And as a member of the American Legion, every Veteran Service Organization has a member like me that has a small business with a little bit of land for 3 trailers. Who is your member with a little bit of land? If you would like to help, please send us message with details. I WANT TO RENT A TRAILER AND HELP VETERANS WITH PTSD!